The container in which alkaline hydrolysis takes place. The California State Senate is considering legalizing liquid cremation. If approved, California will join several other states in offering the controversial process. Supporters consider the method more environmentally friendly. 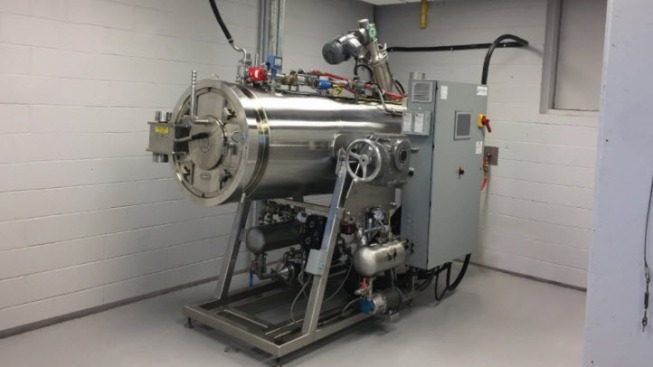 The liquefying process mimics natural decomposition with alkaline hydrolysis, which involves a consistent flow of water combined with heat. Bio-Response Solutions Vice President of Research Samantha Sieber said takes up to six hours. Sieber said Alkaline Hydrolysis using less water than the average US household does in a single day. She also pointed out that it does not emit any green house gasses, unlike traditional cremation. The process of liquid cremation is also cited to be more energy efficient in comparison to classic cremation. A BBC article points out the heat used to traditionally cremate a body could keep an entire home heated for a week during cold winter months. Opponents of the bill though find the process to be unsettling. Executive director of the California Catholic Conference Ned Dolejsi told KQED that the process does not respect the natural cycle of life and death, referring to the steps within liquid cremation. As of July 13, the bill was read a second time to the California Senate.